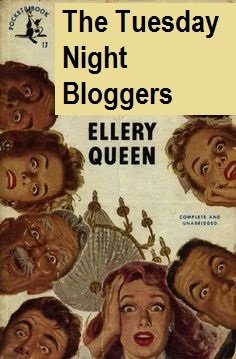 A group of related bloggers who work in the general area of Golden Age Mysteries has decided to collaborate and publish a blog post every Tuesday as the Tuesday Night Bloggers. We began in the spirit of celebrating Agatha Christie’s 125th birthday anniversary. We’re now going to continue with a different Golden Age mystery writer; Tuesdays in November have been devoted to Ellery Queen and Tuesdays in December will be devoted to Ngaio Marsh. If I’ve missed any posts, or if I become aware of later entries, I’ll add them to this post. It’s American Thanksgiving and some of our contributors have celebrations to undertake; I’m sure they’ll return. Hope you have enjoyed this month’s worth of essays; Moira Redmond will be making next month’s announcements.